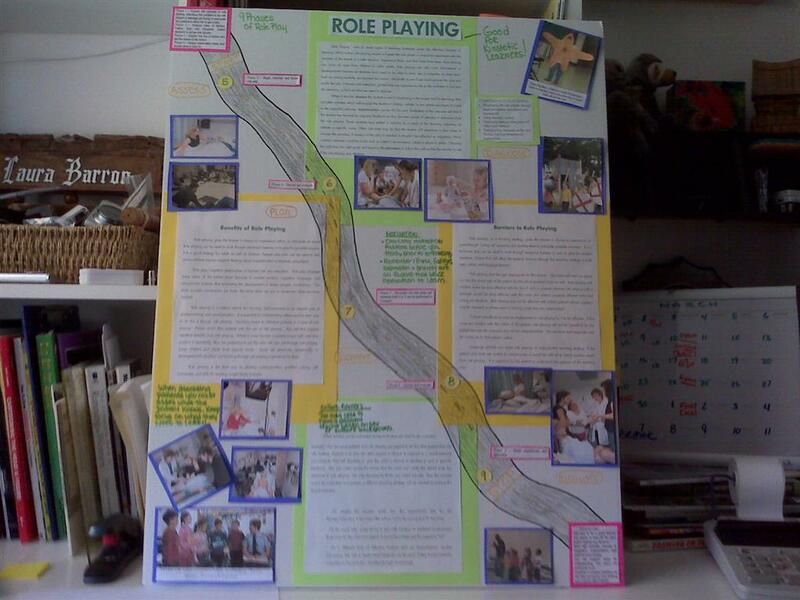 In class we created Posters to explain different teaching styles: My group did Role Play. My notes from the posters presented are listed below. Poster Notes taken by Laura. Verbal contract – what is in it. Agreement notes responsibilities of both teacher and learner. Accomplishing importance of mutual commitment. Between patient and teacher. Requisites: emotionally invested. Learning readiness, cognitive capabilities, participation. Requisites: available, literate, ready to learn, personal. Problems: dyslexia, follow up, may be misunderstood, manual impairment. Advantages: appeals to more than one sense. Provides for individual guidance. Allows for reinforcement. Emphasizes proper sequence. Requsites: emotionally ready, motivated, ready to learn. What can a nurse do as an intervention? Accomplish the A’s of Anguish. If you see Dr. Kubler-Ross 5 Stages of Dying, you can try to apply these A’s. Avoid morphine for woman with asthma who is in labor. Malignant melanoma: the only cancer that crosses the placenta to the fetus. Phase 3—calm state (may decrease over time): batterer may deny violence, state he was drunk, say he’s sorry, and “promise it will never happen again,” returns to phase 1. Phosphatidyl glycerol is more accurate indicator of fetal lung maturity in women who are diabetic. Heart rate is the most sensitive and reliable indicator of impending heart failure. Hypoglycemia can lead to maternal mortality. Complete H. mole: only condition that can lead to maternal cancer. • Vaginitis: avoid douching during pregnancy. • STDs in the U.S.: highest prevalence among teens. • AIDS in the U.S.: fourth leading cause of death among women of reproductive age. Vaginal examinations contraindicated with undiagnosed vaginal bleeding. • Proteinuria differentiates pre-eclampsia from other pregnancy-induced hypertension (PIH) states. • Pre-eclampsia is a disorder of hypovolemia. 1. 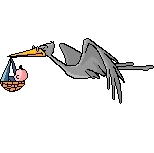 RhoGam is given to Rh- mother who gives birth to Rh+ neonate. 2. Rh- mother after spontaneous or induced abortion (> 8 wk). 3. Rh- mother after amniocentesis or chorionic villous sampling (CVS). 4. Rh- mother between 28 and 32 wk gestation. Since RhoGAM is an immune globulin, rubella vaccination, given at about the same time, may not “take”; rubella titer needs to be redone at 3 mo. Hi Class – This is an Fundraising Email from Kendra Mason! 1) Anyone who would like to work prescheduled Bingo nights. All Bingo nights from April 16th forward and every 6 weeks are ALL on Friday nights. You can work from 1 hour to 6-1/2 hours…your choice. 2) Anyone who would be willing to work on a moment’s notice (same day) to act as a substitute for organizations that were not able to come in on their appointed day. We would substitute for them and we would get the $350 for OUR organization. It’s a way for us to earn donations more often than just every 6 weeks. But, you must be able to assist on the day that you would be called. I am aware that this can be difficult for some people, but we are looking for people who are motivating into helping our CLASS raise more money. Angel’s Bingo operates on Thursday, Friday and Saturday, so none of the days would be other than those three. If you have any other questions regarding Bingo nights, please feel free to contact me via e-mail and I will gladly answer them. Thank you for your assistance. All volunteers are greatly appreciated. Posted in Day-to-Day | Comments Off on Hi Class – This is an Fundraising Email from Kendra Mason! We are scheduled to go to the Dr Phil show April 5nd. The bus will leave around 630-7am and return either 130 or 330 depending if we wish to stay for lunch. I don’t have the full details yet, but when I have 40 people signed up, (I need 5 more!) I will get all the detail information to you and we can decide about lunch. The Dr Phil show will bring in $500 to our class for being part of their taping. They are sending a charter bus to the school to pick us up and bring us back. This is a great way for us to all get together and have a little fun! I need 5 more people. Remember, you can invite anyone! I think there is an age limit, so try to keep the people you invite above 18. Research and report to SNAC of the two possibilities which one would be the most profitable for our CLASS. Work with SNAC in deciding how much should be ordered. Maintaining records of inventory sold. Acting as Financial liaison between all people selling candy and the Treasurer. If you think you have enough time to be able to volunteer, this would help us tremendously. This is volunteering on your time and schedule and we can assist with providing a point person from each of the clinical rotations. Please let either Laura Barron or Kendra Mason know if you would be interested in doing this for our class. 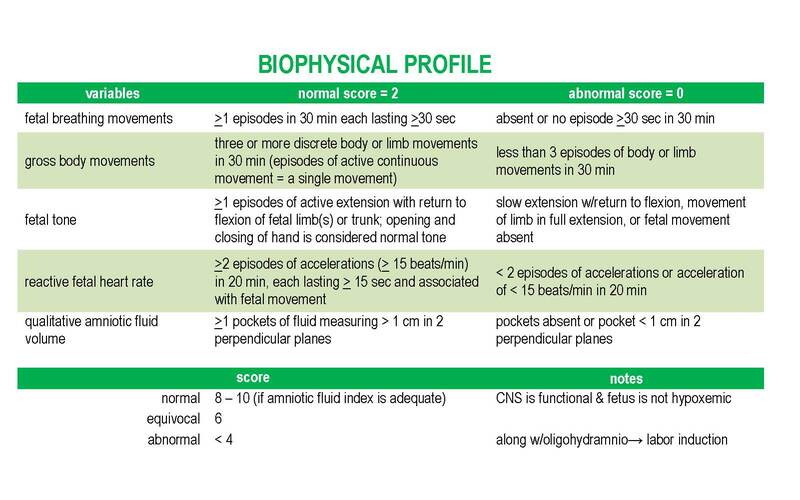 The bishop score is a scoring given to women to determine their favorable condition for chemically augmenting their cervical ripeness for induction of labor. Cervical Consistency is measured on a scale of firmness from firm to soft. The softer the cervix is, the better the chance of vaginal delivery. Cervical Position refers to the positioning of the cervix. If the cervix faces front (anterior) it is more favorable, while posterior is less favorable. Cervical Effacement refers to the softening and thinning of the cervix. You won’t feel this happening; it may only be measure with a vaginal exam. Effacement is measured in percent. When your cervix is normal, it is considered to be 0% effaced. When you’re 50% effaced, your cervix is half its original thickness. 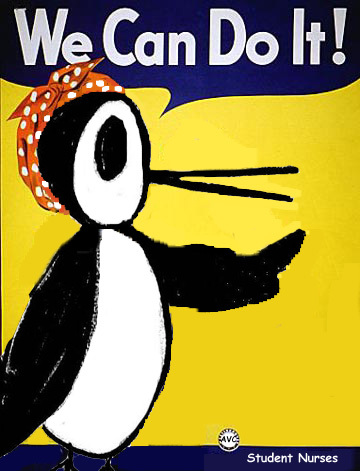 When your cervix is 100% effaced it is completely thinned out and you are ready for vaginal delivery. Cervical Dilation is measured in centimeters, from 0 to 10. Your cervix is fully open and you should be able to push when it is dilated to 10 centimeters. Occasionally, a physician will measure dilation in “fingers.” Dilation often begins days or weeks before labor actually begins. 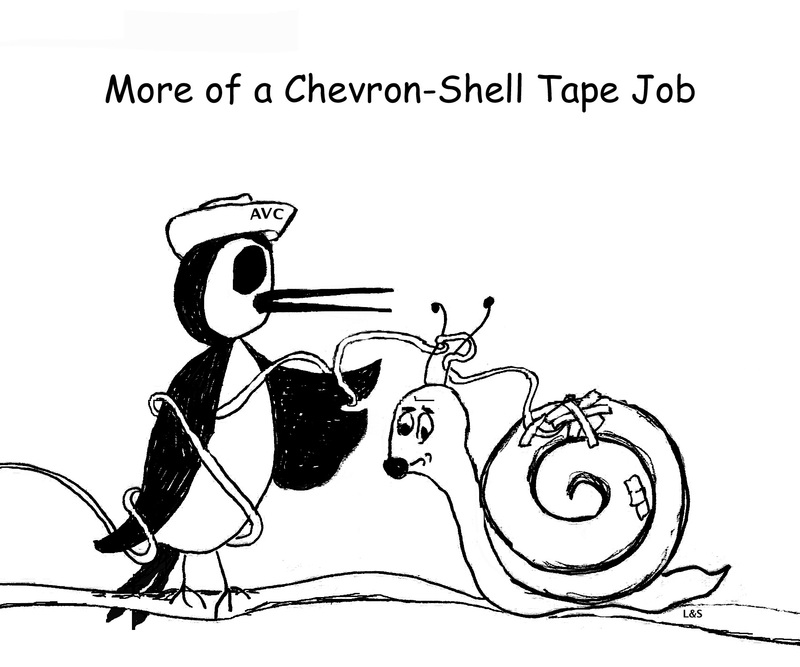 At first, the progress may be very slow. Some women may be dilated 2 to 3 centimeters long before labor. Once active labor begins, you will begin to dilate more quickly. 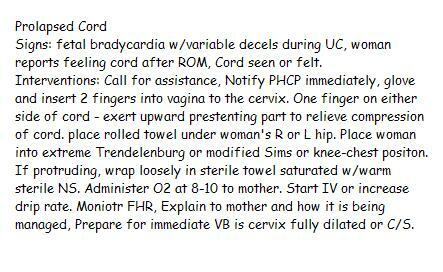 Cervical Station is a term used to describe the descent of the baby into the pelvis. An imaginary line is drawn between the two bones in the pelvis (known as ischial spines). This is the “zero” line, and when the baby reaches this line it is considered to be in “zero station.” When the baby is above this imaginary line it is in a minus station. When the baby is below, it is in a “plus” station. Stations are measured from -5 at the pelvic inlet to +4 at the pelvic outlet. There are modifiers to the scale which includes adding and deleting points dependent upon preexisting conditions and timeline of parity. Does anyone want to vote?? My name is Liza and I write for the Lydia’s Uniforms Blog. I just wanted to leave you a quick comment because we’re currently holding a contest where our readers can vote on the top nurse blogs. We’ve selected Student Nurse Laura to be on our list of the top 25 – congratulations! 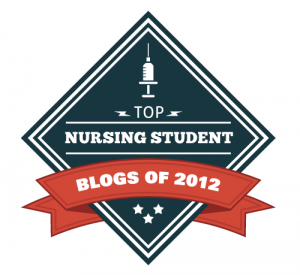 If you would like to vote for your blog, or have others vote, please visit this link: http://blog.lydiasuniforms.com/blog/lydias-uniforms/0/0/top-nurse-blogs-cast-your-vote. We’ll be announcing the winners during Nurses Week 2010. Best of luck and thanks for your time! If the outlet of the pelvis is WNL, will a NB with a Biparital of 10.5 be a SVBD? The marked variability of a FHR BL at 139 is ________to ______. If you have 2 accelerations of less than 15 bpm for at least 15 seconds, is it considered to be a reactive trace? If your patient/mom is on MgSo4 with a lab level of 10, what is your concern? An doctor orders the patient to receive 2 mU per minute. What do you set the IV infusion rate at? I was speaking with a teacher the other day and wanted to share the views and thoughts of this wonderful instructor. With math in the nursing program, it isn’t just multiplication and division, but the life that runs through your veins giving expertly concise information to the needing patient who will respond from this elixir. It’s more than math, its your ability to provide a nursing intervention and care by using this tool. From Modules 7 & 8 these are the following things Math Related – well, first I’m walking – then I’ll post! Stay tuned! Our second meeting of the Antelope Valley College (AVC) California Nursing Students Association (CNSA) of the National Student Nursing Association happened today. We are officially a club under the ASO of AVC and we are officially a club under the NSNA!!! Today we voted and passed to offer all graduating student nurses a blue and white graduation cord of the NSNA if they are a member. Being able to share in whatever way we can to make our fellow student’s step forward into nursing a better one is awesome. Congratulations to all the graduating student nurses! Lab: urine = pos for sugar & acetone; Blood glucose = >200 mg/dl Notify PCG. 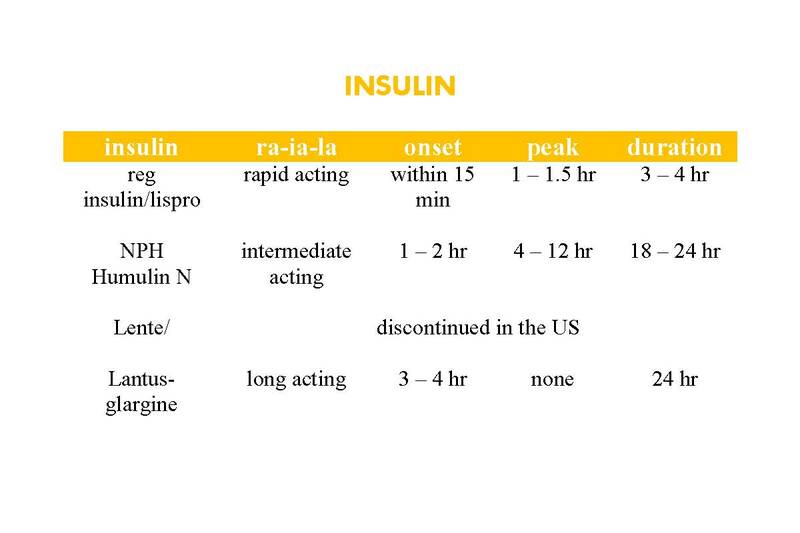 Admin insulin in accordance with b.g.l. med chart. Give IVF NS or 1/2NS, K+ when urinary output is inadequate; bicarbonate for pH < 7. Dysfunctional Labor is described as hypertonic or hypotonic increases a woman’s risk for uterine dystocia. I was asked where a person can find an ongoing CPR course. Currently, as students of AVC in the health profession, we are required to have ours attained by American Heart Association. The American Red Cross also gives CPR courses, but make sure you get exactly what your school requires. If you are in the greater Antelope Valley area – an ongoing place to take many different courses is Life Support Associates, Medical Education Consultants http://www.lifesupportassociates.com/ in Acton, CA. This is where I took the ECG course. Steve Rodgers (Instructor, Owner) who taught my class said he would give a price break for a group from our school/class for any course we wanted to take. Please check their site and give them a call. Engagement – biparietal diameter of head passes the pelvic inlet. Flexion – chin of head brought into closer contact with fetal chest, allowing smallest diameter to present first to inlet. Extension – emerging head by first the occiput, then face then chin. Restitution and External Rotation – rotation of head (45°) after born to the position it occupied when it was engaged in the inlet. Then (external rotation) the head rotates further as the anterior shoulder engages. Expulsion – After birth of shoulders, baby is born by flexing laterally in the direction of the symphysis pubis. 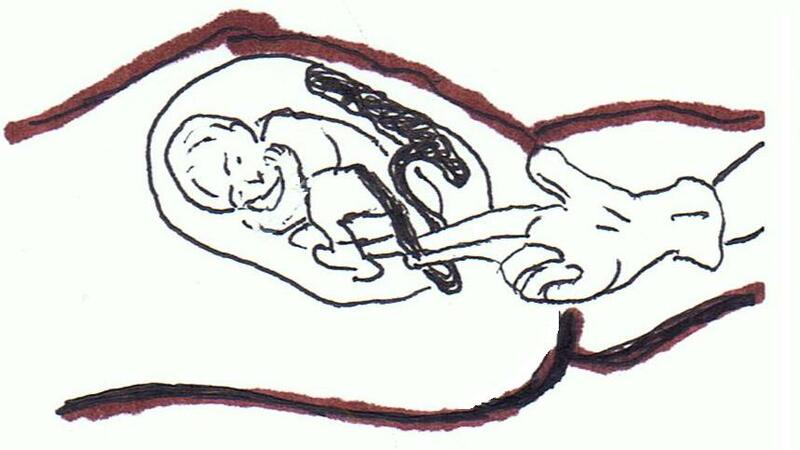 Synclitism – Pelvic inlet plane is parallel with sagital suture of infants head. Each ear of the infant passing through the inlet at the same time. Asynclitism – Pelvic inlet plane is intersected by the plane of the sagital suture. You can think of this as one ear passing through the inlet before the other.